We are three days away from Christmas. How are you on your shopping? Have you been finished since Black Friday or are you still scavenging the stores for that perfect gift? Are your homes filled with warmth and cheer? How many holiday parties have you attended or thrown? Without a doubt, this is one of the most exciting, stressful, and joyous times of the year. People all over the world are celebrating their holiday of choice and then making new years resolutions to make the new year special. Here on the AQT, quilt squares and downtown’s are filled and decorated with holiday splendor. Christmas lights are strewn, local Christmas trees are being cut and decorated, snow if even falling in certain elevations. As we get closer and closer to Christmas I can’t help but think of some very special Christmas songs about the south. Mainly “Tender Tennessee Christmas” and “Christmas in Dixie”. We do have some very special moments here below the Mason-Dixon line. Only here can you get snow and sunshine for Christmas. Snow glistens and lays differently on the mountains here. On the Blue Ridge they snow has that blue hue, the Smokies have an even more smoky look to them. Some of the areas along the quilt trail can remind you of a snow globe because you are nestled by the mountains, snow is blanketing the ground, and then snowflakes are falling. What is Christmas like in your part of the world? Any fun traditions in your neck of the woods? Please share! What is it about backroads that are so special? Is it because of the way they wind and curve and wind and curve and wind and curve? Or is it the peaceful silence of being surrounded by nature and mountains? Or is it because the speed limit is a little higher than it should be so it calls for fast pace driving with the windows down and wind in your hair? Maybe it is all of that. It is the experience. You experience an adventure. You never know what is around that bend. Is there a farm? A mansion? A turtle crossing the road? A baby deer? Lord forbid a stop sign. Sometimes those roads go on and on and on and on and on and you think they will never end. You want it to end, but at the same time you don’t because once you hit the main drag you know the adventure is over. That is the great thing about the Appalachian Quilt Trail. So many stops are on these backroads! 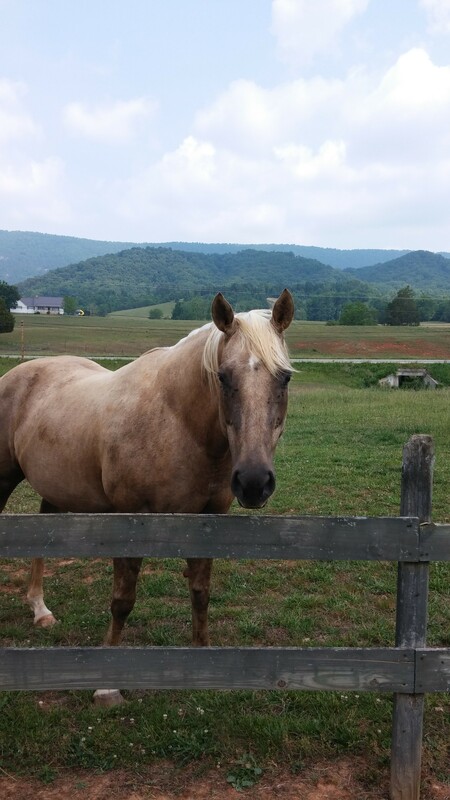 A visitor, especially maybe someone who is new to country backroads, will have an adventure. Even for us locals, the backroads and AQT will always have an adventure in store. 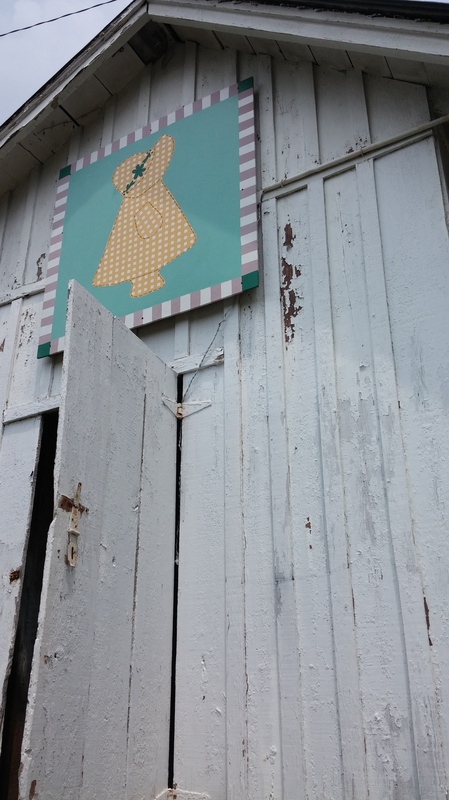 Every time I have cruise the quilt trail in search of my next stop, I always end up on a backroad in a beautiful, unfamiliar, yet homey place. Picturesque mountains and fields surround my car and I feel the wind passing through the car as I drive and drive and drive and drive till I find my waypoint or trail stop. This is exactly what happened the other day. My adventure was to find Canaanland Park in Washburn, TN to get a picture for the AQT website. Lets just say my GPS definitely took me on a super huge rabbit trail. 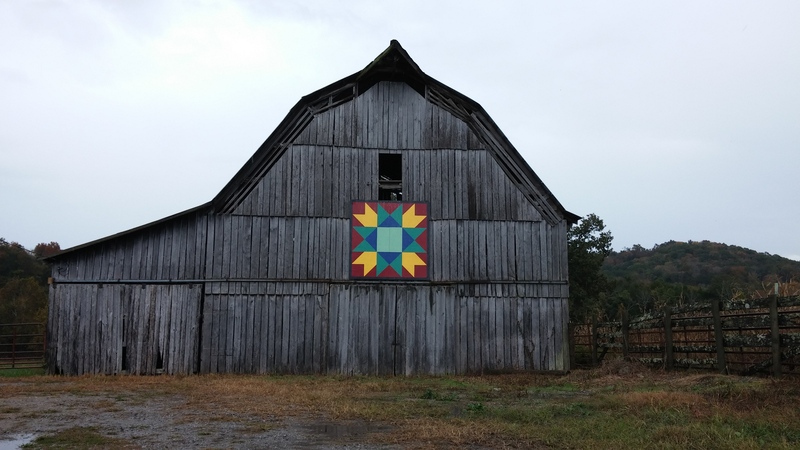 While on this rabbit trail I got on a “main” back road (a lovely thing in the rural South, a back road that is actually a main road, no stoplights), and found a variety of quilt squares that I didn’t plan on seeing. What lovely surprises! Around each bend was a new adventure on the AQT. 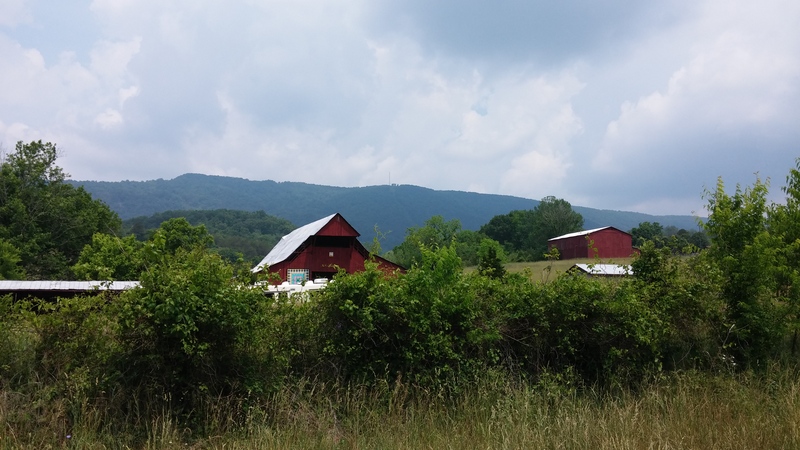 There were moments I was so wrapped up in the scenery that a few quilt barns popped up and I missed them and couldn’t take a picture. I guess that gives new meaning to pay attention to your surroundings! 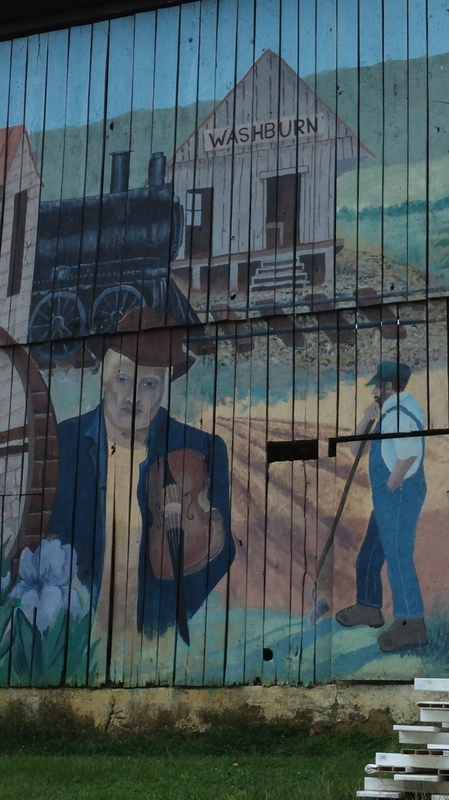 I did happen to stumble across a barn mural, Not Barn Yesterday. This is a very special stop on the AQT. While not exactly a quilt square, it does depict the heritage of this area and everything the trail stands for. It was painted by local high school kids from the Washburn area. It is definitely something to see! Then right down the road, about 5 minutes, BAM! There on the left was Canaanland. Again, it was one of those I wasn’t expecting so soon so I had to turn around and get to it. 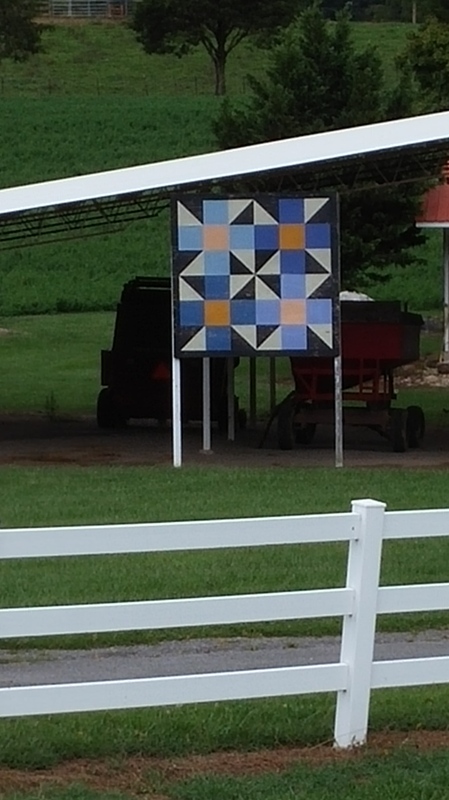 Their quilt square is called Windmills All Around. It is a stunning piece, large enough, and purple enough to see from the road. A beautiful long driveway with trees is a grand entrance. Canaanland is available for community events and parties. 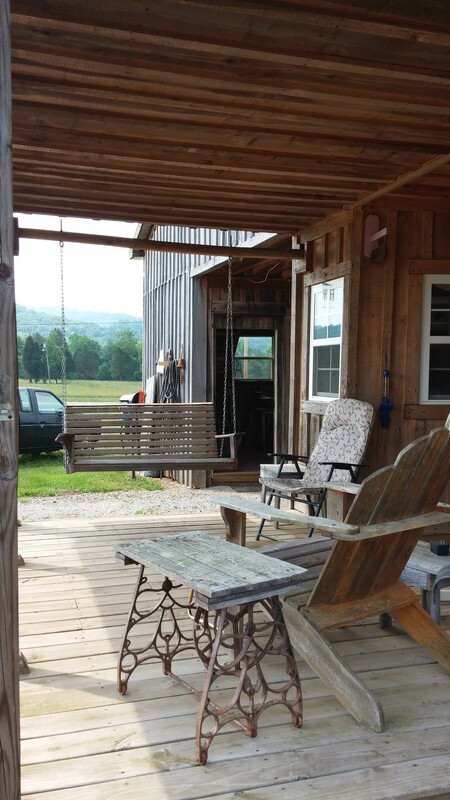 It seems like a great venue to do a country wedding or outdoorsy/southern inspired birthday party. You will even get greeted by a sheep that is at the road. Welcome to the trail Smith Drug Store! 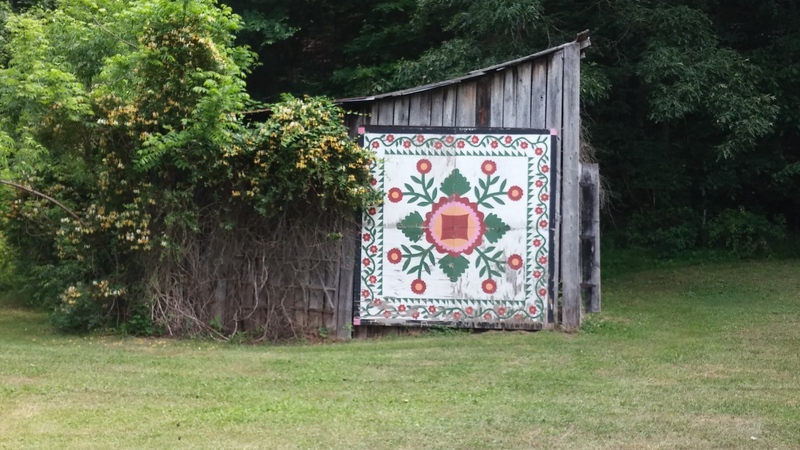 It is always an exciting time when a new quilt square is added to the Appalachian Quilt Trail. 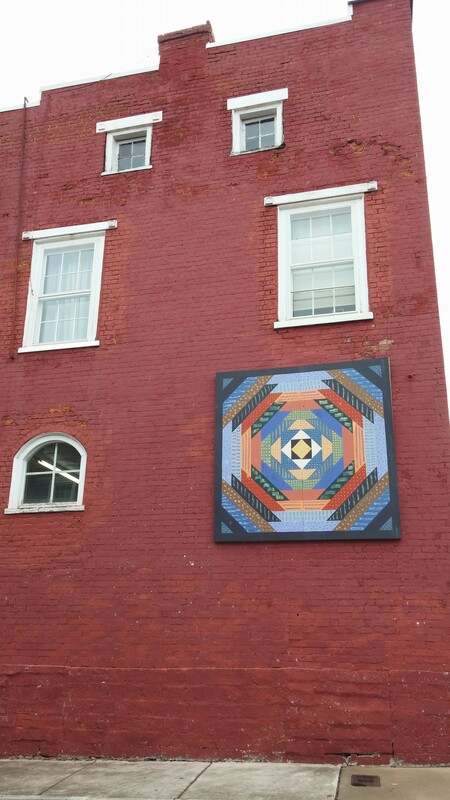 Recently a Prickly Pinwheel was quilted to the Smith Drug Store in Rutledge, TN (located in Grainger, Co). This store is a Rutledge landmark. Smith Drug Store has been here for 109 years. It was opened in 1905 and celebrated its hundred year anniversary in 2005. Smith Drug Store was owned and operated by three generations of the Smith family. It was bought out in 1992 and two years ago a Rutledge native, Jill Cabbage, (who also worked there as a teenager and used it as her pharmacy). Smith Drug Store was originally located next door where the Salon at Rutledge is. Its current building was erected in the 1980s. While talking to Jill, you really got the feel of Smith Drug Store and how their focus is on friendliness and service really overflows into all aspects of the store. Upon walking into the store, I was greeted with smiles and saw that people who came in were greeted by their name and the staff knew their orders and history. Jill says that they see customers as family and friends. They need to be treated like how you would want your friends and family to be treated. Her staff is one reason why Jill thinks people would like to visit the Smith Drug Store. Another reason is due to the local items and snacks that they also carry. 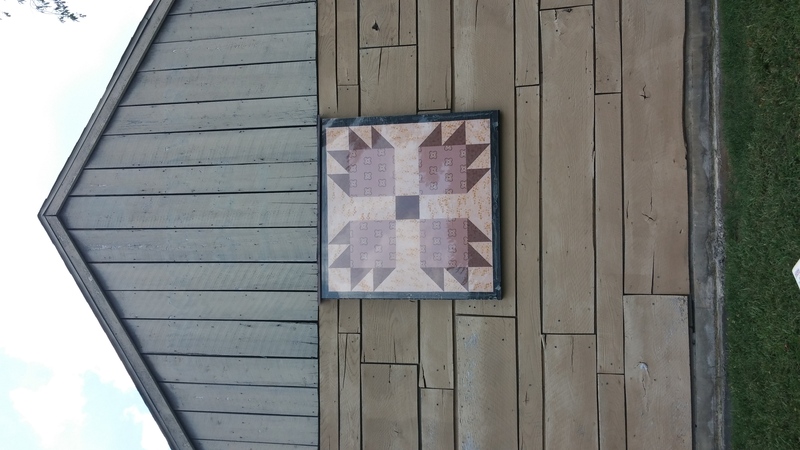 When asked about why Jill wanted a quilt square on the store she replied, “Because they are pretty and they highlight the history of an area. 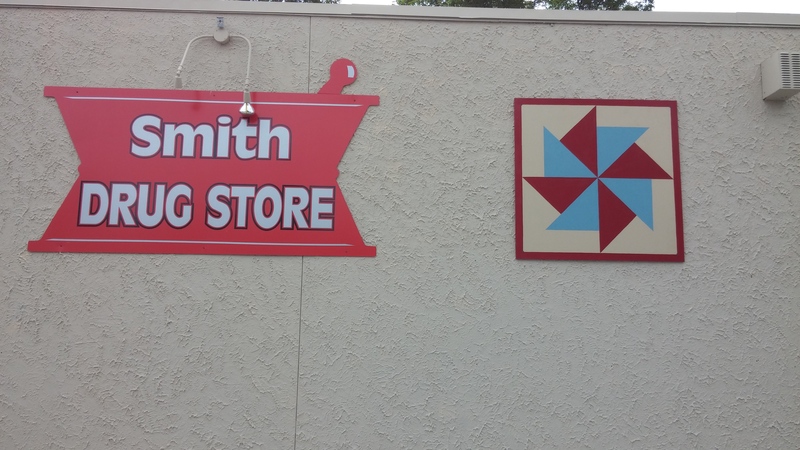 Smith Drug Store is definitely a historic spot here in Rutledge.” The pattern, prickly pinwheel, is a pattern from her grandmother. 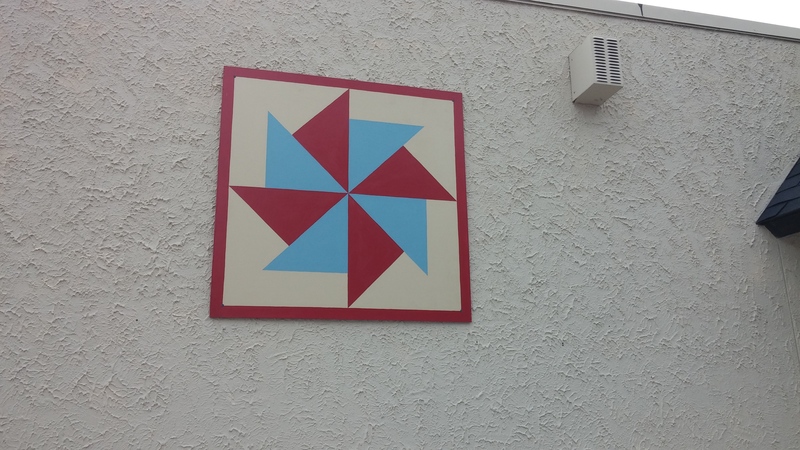 Her grandmother was an avid quilter and pinwheels were her favorite. 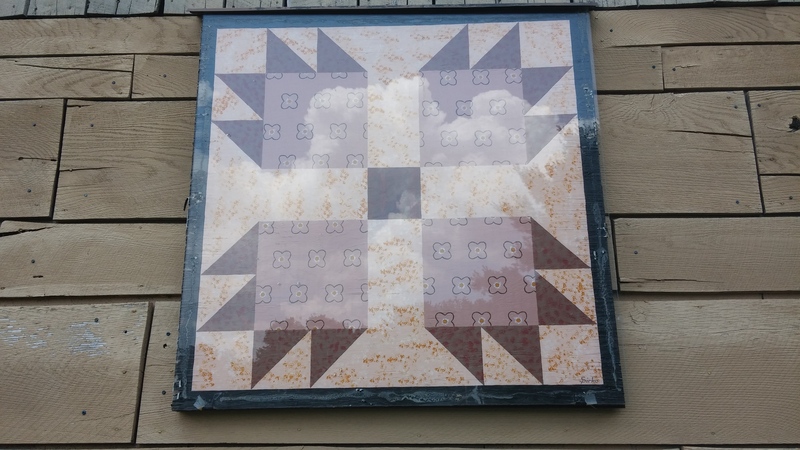 This square is an original design from one of her many pinwheel quilts. Jill hopes that one day her children will take over the store and continue the tradition of family owned drug stores. 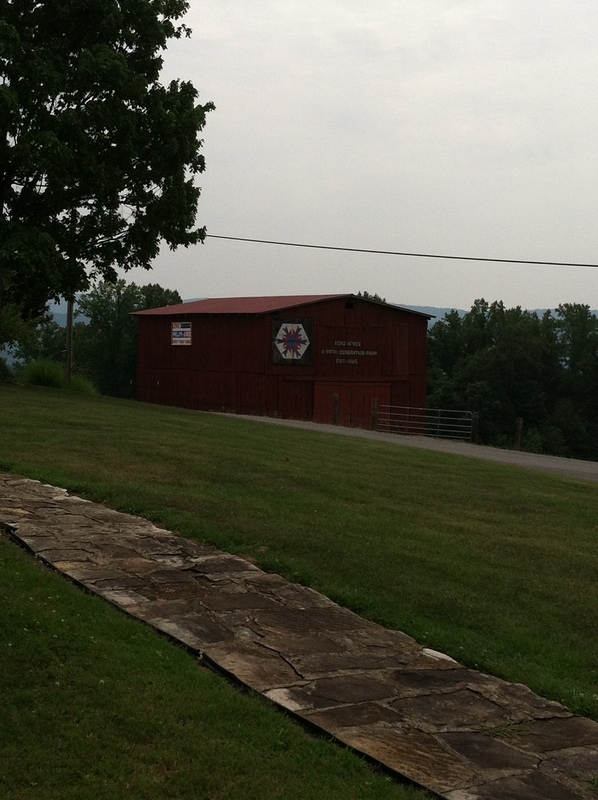 The Rose Center is a very historical and important piece of Morristown, TN’s history. 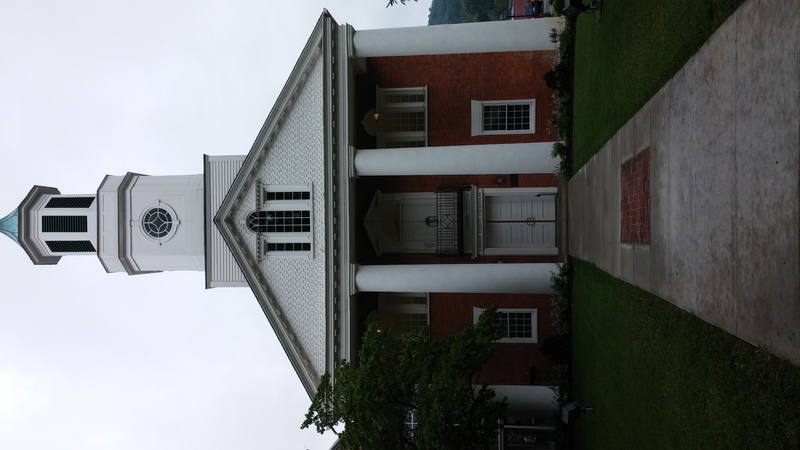 What first started as a co-ed high school built in 1892 has now turned into the cultural center of Morristown. The Rose Center operated as a high school from 1892 up through 1975! After the school closed, monies were raised to turn it into a cultural community center. It now houses an art gallery, educational workshops, art workshops, drama workshops, fitness classes, dance classes, music classes, and a variety of other programs. 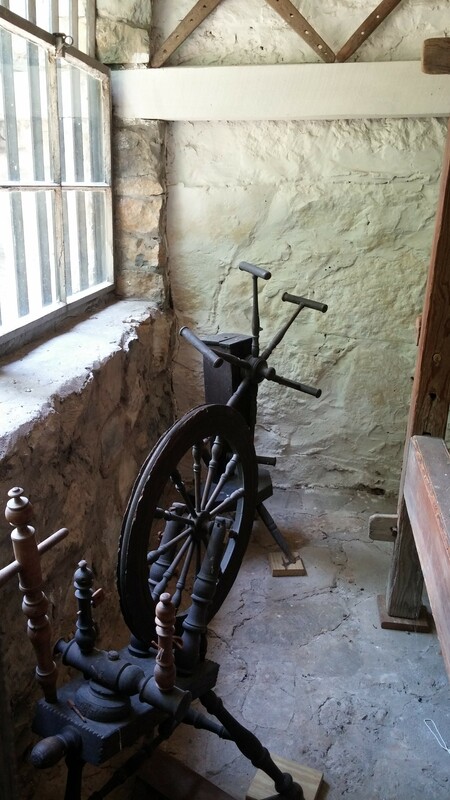 It also acts as a history museum, and there are still original classrooms open for tours. 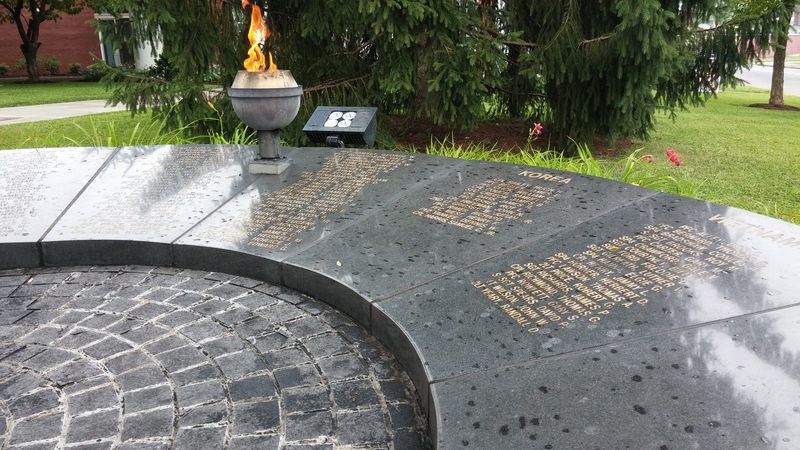 For more information on the Rose Center’s history, click here: http://rosecenter.org/wordpress1/about-the-rose/discover-our-history/. 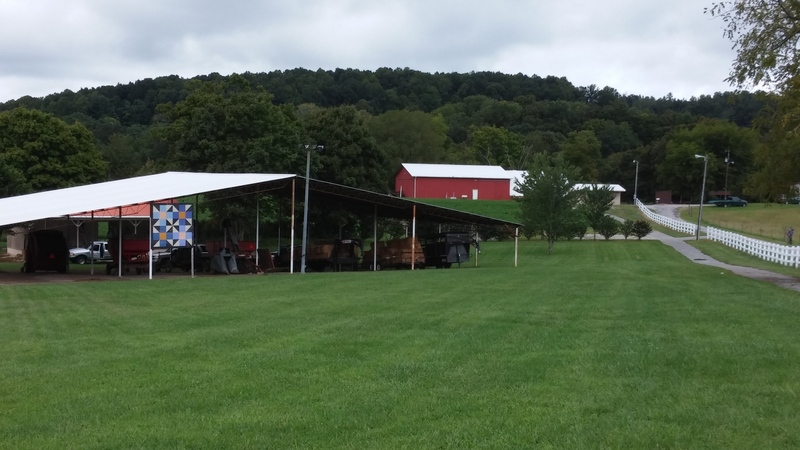 One of the biggest events the Rose Center puts on is the annual Mountain Makins Festival. It is held every year in either October or November. 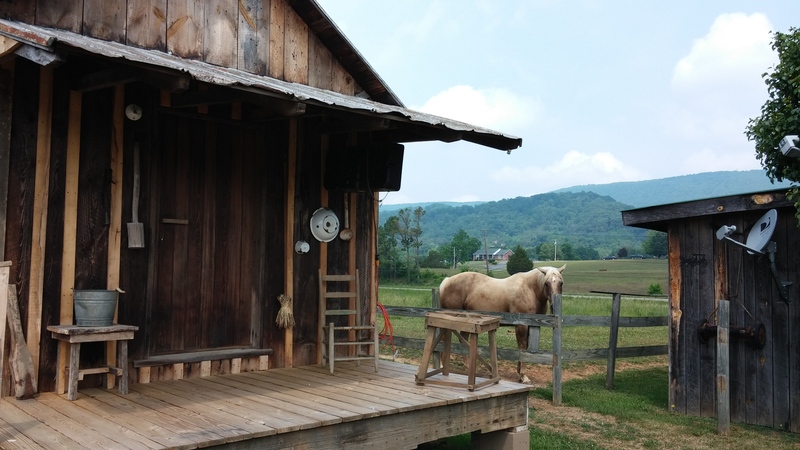 Mountain Makins celebrates all things Appalachian Heritage as well as everything art, especially local artists. The festival will have dancers, open art exhibits, old timey/heritage dress and ways of life, local food carts, and so much more. 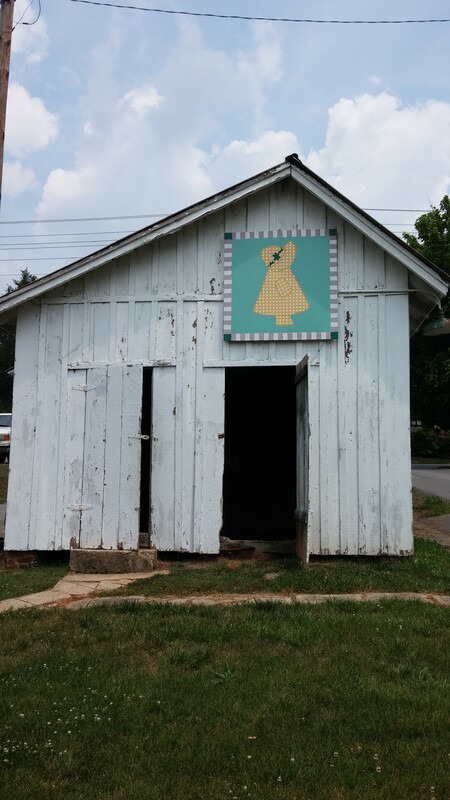 If you need a reason to hop on the quilt trail and really see Appalachian Heritage, this is a great reason! The Rose Center is also available to rent for your wedding, party, or big event. Community is the word that really fuels them. 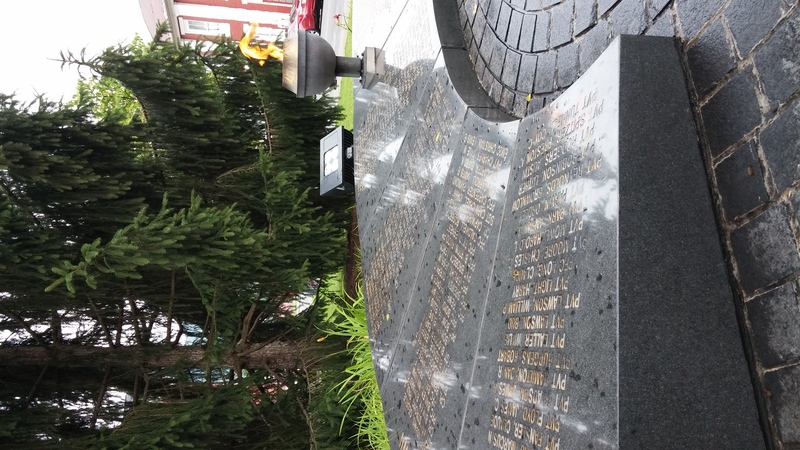 Not only do they provide services for the community via arts initiatives and programs, they rely on the community and grants to keep them going. 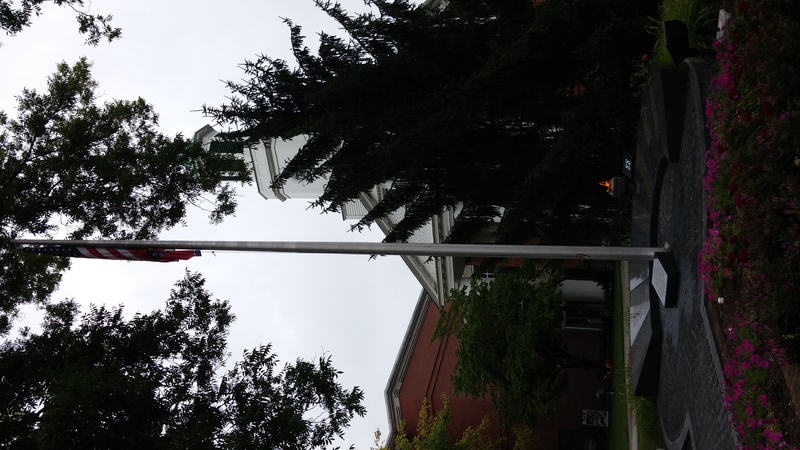 Without supporters, the Rose Center, Morristown’s cultural center, would not exist. 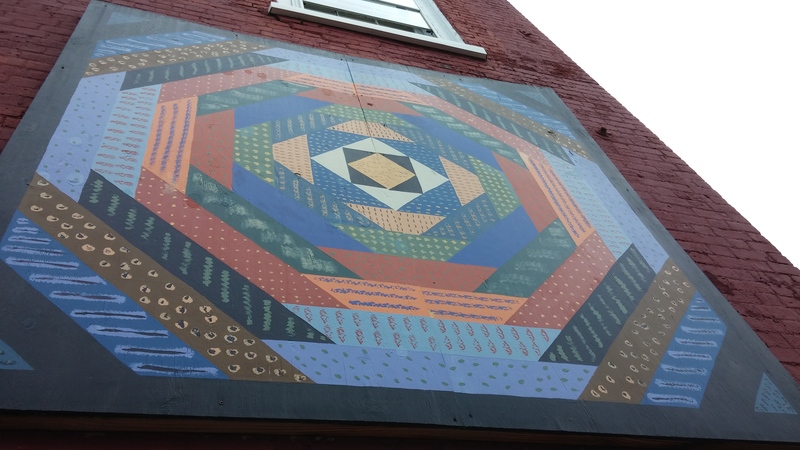 So take some time and look at these pictures and then go on down and spend some time at the Rose (then stop at Java Garden for a coffee-which also happens to be right across from another quilt square!). Rain. 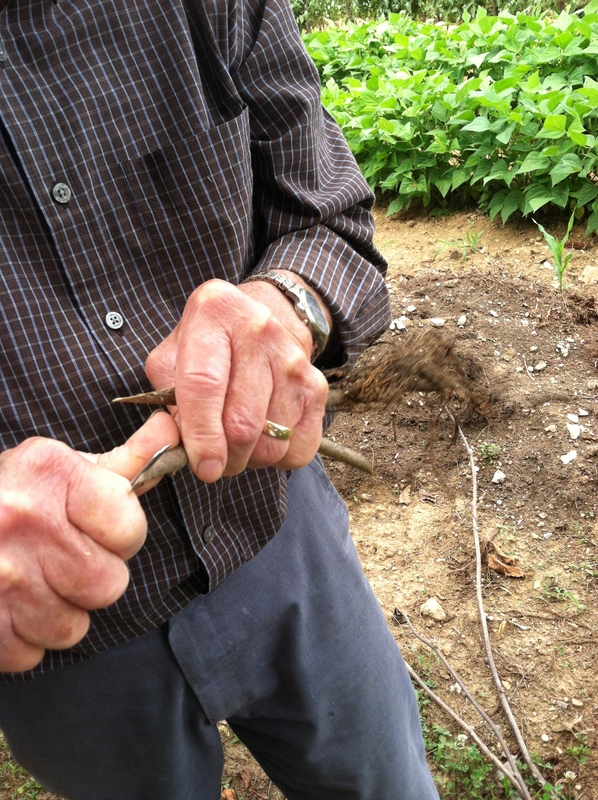 It smells good, it feeds our crops, it refreshes the air and washes away pollen but…it can be an inconvenience. For businesses, it can mean a slow day because no one wants to get out in the rain. As a consumer, you may not like to get out in the rain. However, rainy days can lead to great adventures and some special “one on one” time with locals in the shops downtown. You can explore places you have been before in a different way. Experiencing some quiet time as you look over art or see a different kind of beauty in the flowers that line the street. This is exactly what I encountered on my rainy Friday trip to Rogersville. I am not a fan of rain, but I wanted to get out and explore some of the AQT. While downtown, I went to the courthouse and then onto a new favorite place, the Local Artists Gallery on Main. As I walked into the gallery, I felt such a warmth and openness from the space itself and the three artists who were working the gallery during the morning. They took time out and walked me around the gallery, explained to me what makes this gallery special, and some of the artists that are juried in the exhibits. What is amazing about the Local Artists Gallery on Main is that it is a co-op (cooperative) and non-profit. It showcases a variety of the 50 artists that participate in the co-op. The Local Artists Gallery updates and switches out juried material on a regular basis, so every time you go, there will be new things! You will find pottery, wood working, jewelry, Chinese Ink paintings, candles, crochet, photographs, a year round Christmas corner, quilts, and some very unique offerings. Since this is a cooperative, there is no markup on the art. So if something costs $15 it is $15, not $30 or $40 that it would be at another gallery. They focus on giving as much money back to the artist and take out only what covers utilities and rent. Not only do they offer a special, one of a kind gallery, they also offer a variety of art classes taught by the juried artists. Classes are for all ages and like the art, it is constantly changing. I was told from the artists working that morning, that the classes are a positive environment meant to share the love of art and perhaps turn someone on to their inner artist or love for art. Walking through the huge building you can tell that each artist loves what they do by the energy that comes out in the work. There is something for everyone, and with the prices at true value you can’t help but want to buy the whole store! The Local Artists Gallery has been open since 2006 and has stayed in the same building since its inception. For more information on classes and the artists themselves check out their website: http://rogersvillegallery.com/ or stop by and visit them at: 124 East Main Street, Rogersville TN, 37857. So, on your next rainy day don’t stay inside; head to Rogersville and support your local artists! Pineapple Log Cabin…what beautiful colors! 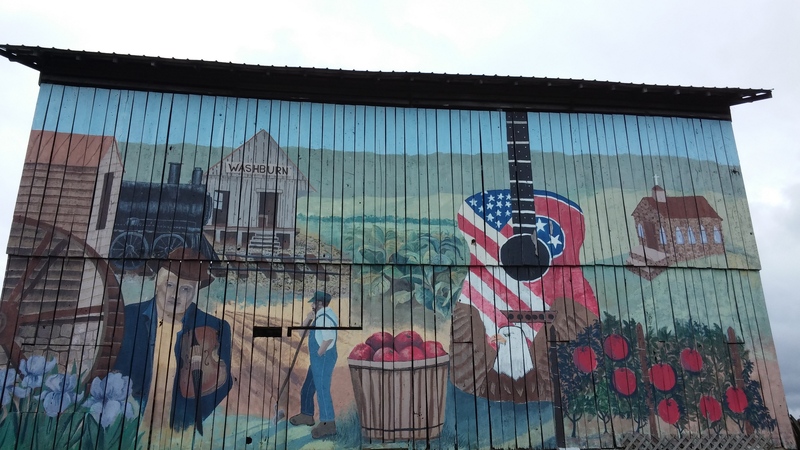 Appalachia is filled with so much history, from how our area was settled by immigrants who weren’t supposed to settle in the mountains, to our music, to our way with food. Even our early settlers and pioneers were characters whose histories are filled with just as much folklore as they are with genuine facts. 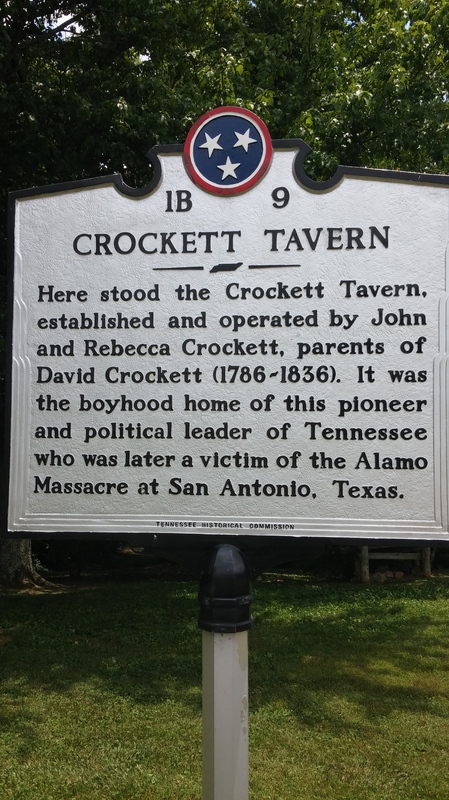 Appalachians are known for their storytelling and I got my fill of it, both historic and of the tall-tale kind, on my latest trail stop: The Davy Crockett Tavern. David Crockett (who never referred to himself as Davy) was a frontiersman, politician, Americana figure, and solider. He was born and raised in the Limestone/Green County/Hamblen County area of Tennessee. Although his childhood home is in Limestone, the tavern, run by his parents, is located in Morristown. 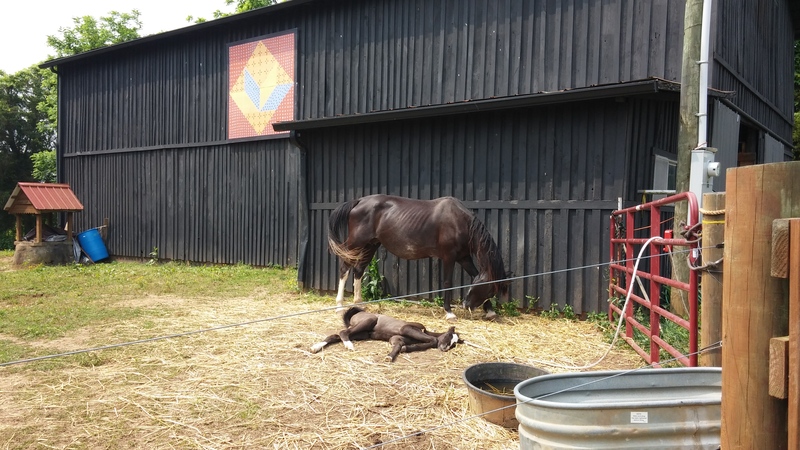 Here, individuals could eat, sleep, drink, and rest their horses. Growing up, David helped steer cattle and hunt game for the tavern, and he really did shoot black bears and wear coonskin caps. Crockett was part of the Tennessee House of Representatives and later held a seat in the 21st United States Congress. He served two terms, then went off to fight in the Texas Revolution, where he died defending the Alamo. What makes him such a folklore legend in Appalachia are tales of his larger-than-life personality, his charisma and his appearance. Crockett was known for his pointed nose, rosy cheeks,large forehead, and small chin. He also told some stories himself. While many people get him confused with Daniel Boone, Crockett and Boone never knew each other. Boone was alive 50 years before Crockett. I learned this and so much more from my tour guide, Sally. I could tell that Sally loved telling the story of Crockett and life in the pioneer days. 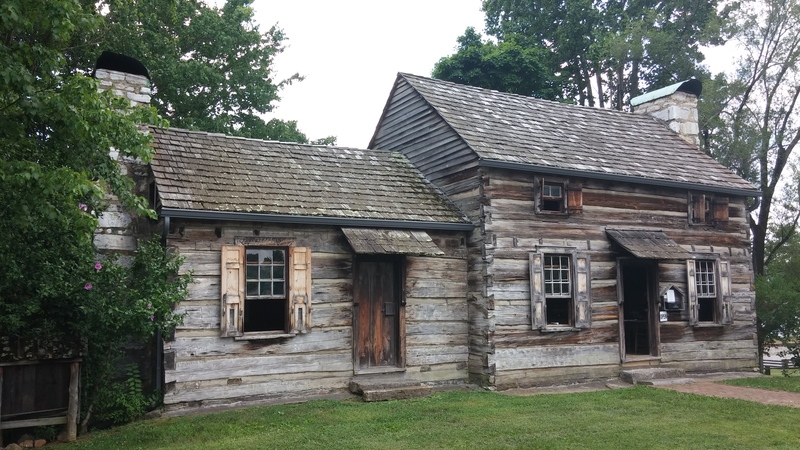 As she walked me around the premises of the historical site, she told me tales of the fire that made the Crocketts relocate, how David’s grandparents are buried in Rogersville, and about the grist mill his dad had. 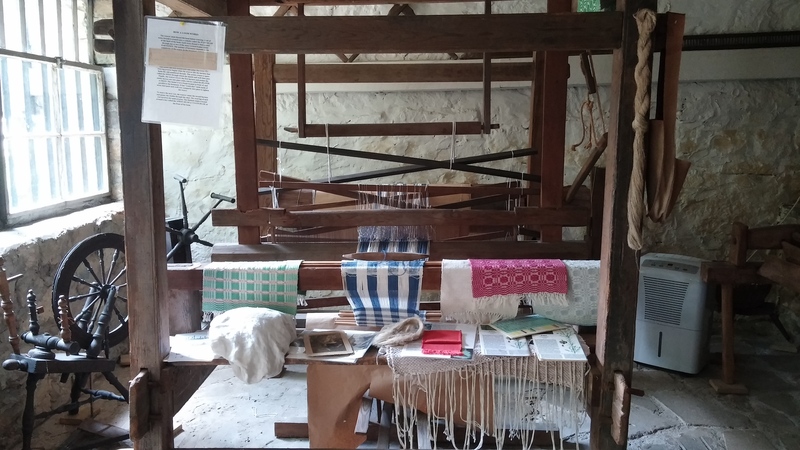 Sally also took me through a looming room and taught me about looming, spindles, the different kinds of thread they used (like flax! it isn’t just for eating! ), and how they used a certain type of bug, called cochineal, to dye things bright red. I even learned where the childhood song, “Pop goes the weasel” comes from (and it isn’t about a real weasel chasing a mulberry bush). I saw old cast iron skillets, pots, irons, and curling irons. Sally showed me old coins and old paper money. There was even a ledger from the store that David’s mom, Rebecca, bought from. Believe it or not one could get a lot of stuff from that store. She was filled with so much knowledge that I could have stayed all day and listened to her. She was that good. While I was finishing up my trip more visitors came in for a tour. Sally’s face just lit up; she was so eager to show them around the tavern. 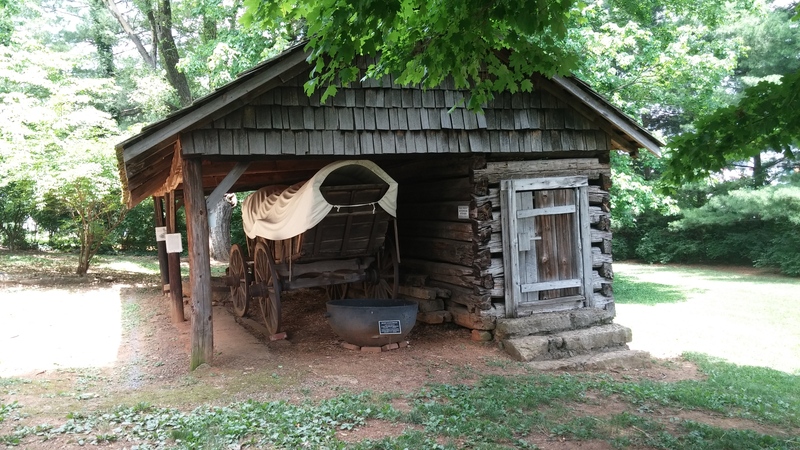 The Association for the Preservation of Tennessee Antiquities is the group that helped to restore, rebuild and acquire items for the Tavern.The APTA acquired the land in 1957 and the museum was built between 1957 and 1958. The furnishings have been donated by local families via the APTA. Outreach is very important to them, so they hold educational field trips and do work with Eagle Scouts. 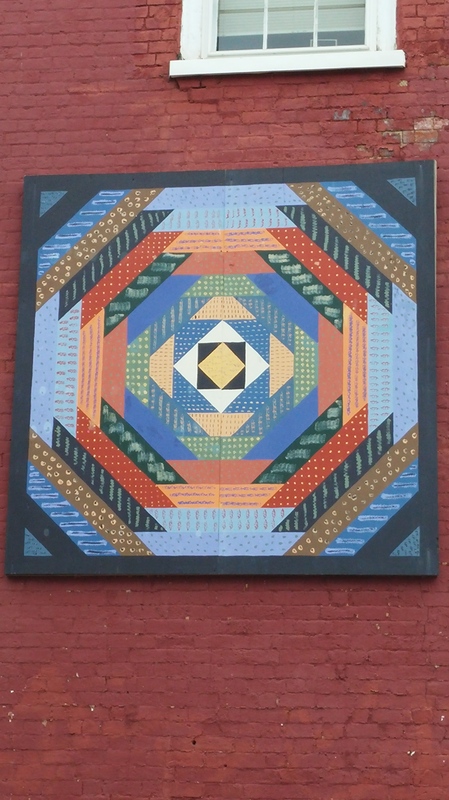 Their quilt square is a 4×4 piece painted by a local Morristown artist, Robert Spirko. 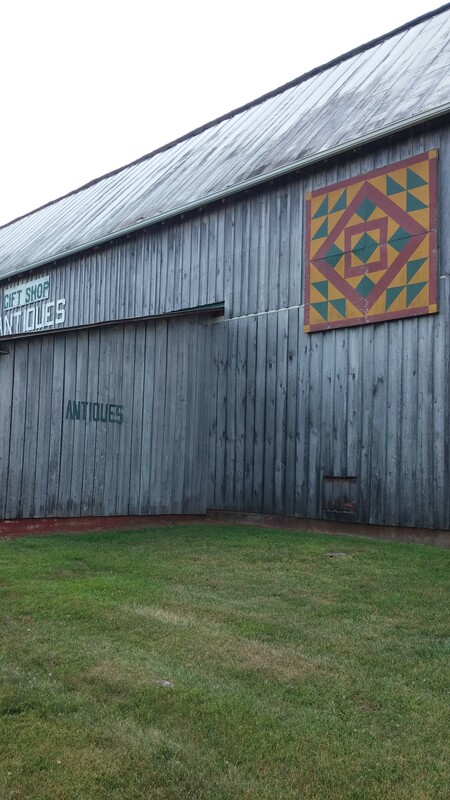 The quilt square came to them from Nana Bear Quilts, which was a popular quilt store/quilting place in Morristown. 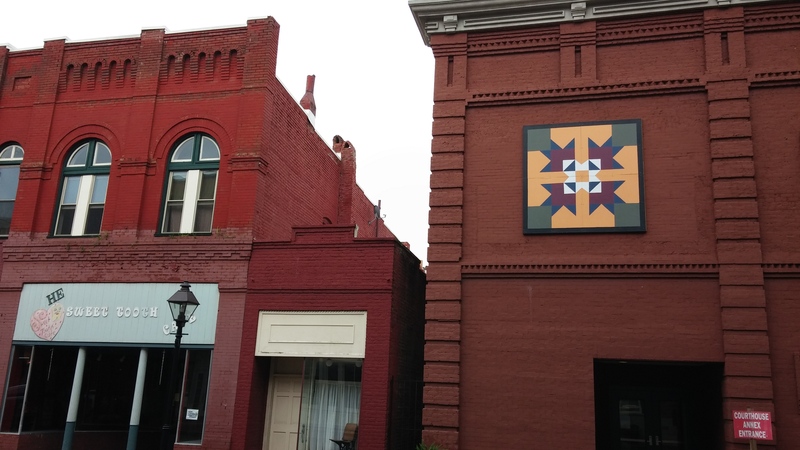 When they closed, Nana Bear Quilts gave the bear paw square to Davy Crockett Tavern. It is significant because Davy Crockett was very proficient in his hunting skills, and it is one of the things he is known for. 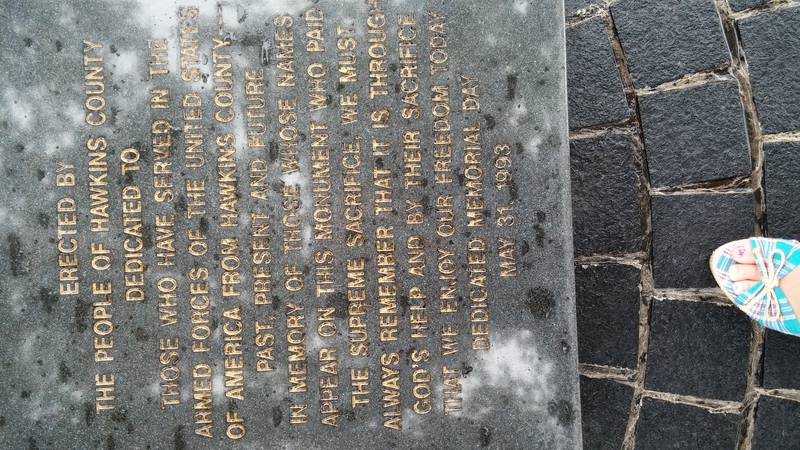 This is a great place for families and those interested in history. For $5 you get a guided tour and your money goes to help keep up the Tavern, which is taken care of by volunteers. Up close view. It is covered by a protective glass to keep it from getting weathered. Bear Paw quilt pattern. It was painted by a local. 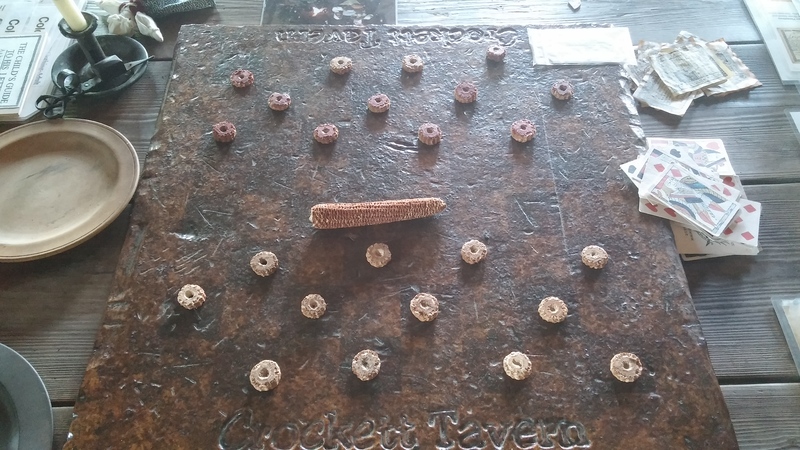 Up for a game of checkers? They would use the end of the corn cob, and color them with a market to differentiate the sides. They were called draughts. 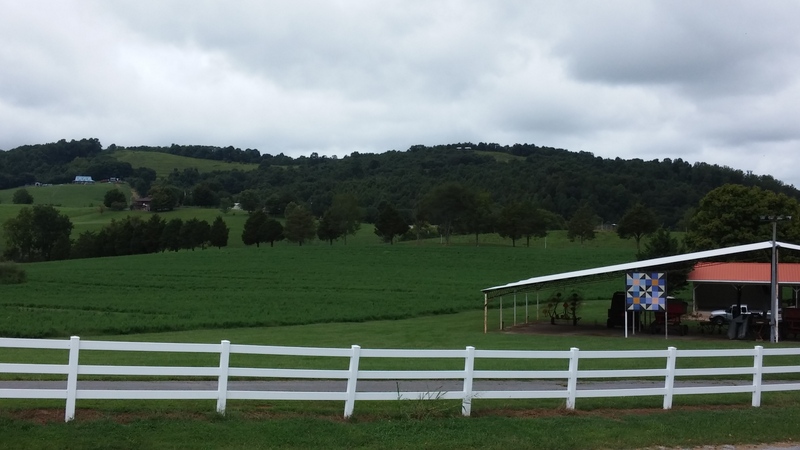 Last week I shared with you my first two stops on my sunny days tour around Rutledge, TN. 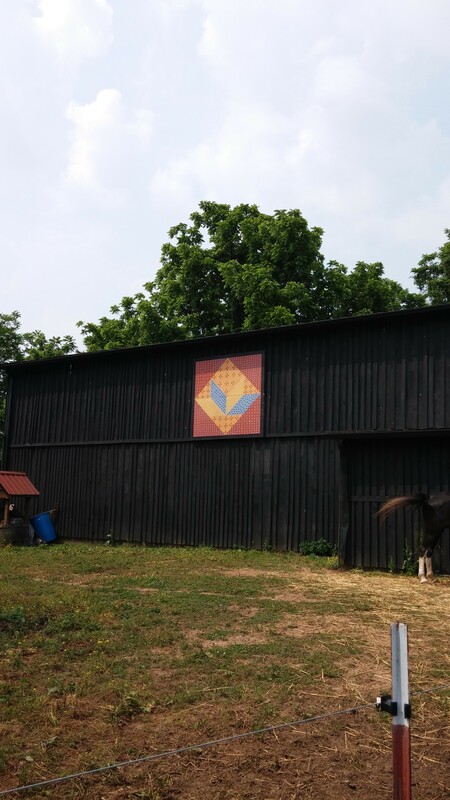 For those of you who might be new, here is the link for last weeks entry: https://sawtoothstories.wordpress.com/2014/05/27/winding-roads-horses-honeysuckle-and-quilt-squares-pt-1-rutledge-tn/. I also got some lovely comments and new followers, so thank you very much! Here are stops 3-5, enjoy! Located right on 11 W at the side of the road, just getting off the road to take a picture was an adventure. 5 turnarounds and a driveway later I finally found a good spot to land a picture or two. 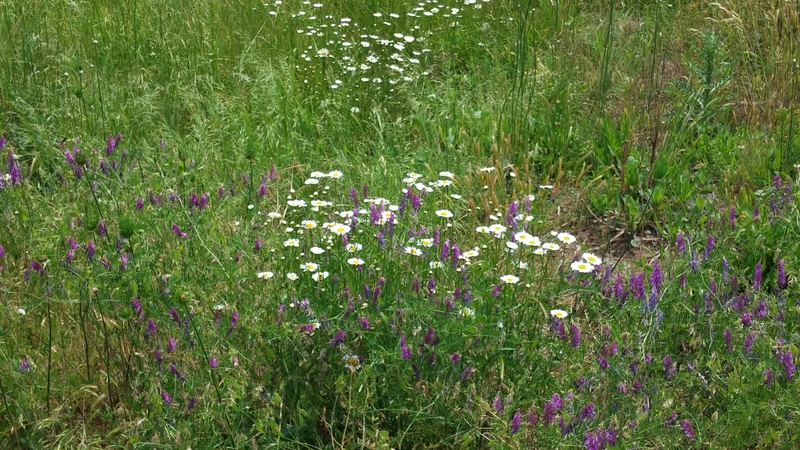 Look at those wild daisies and other wild flowers! To view the square, click the picture below to enlarge it. Isn’t this a beauty? This is a little shed on the right side of the road. It is right across from a very gorgeous old fashioned home that house two great Pyrenees dogs. I found that out because they barked at me as I stopped in the middle of the road to take a picture (yes, I did it country style, just stopped in the middle of road). 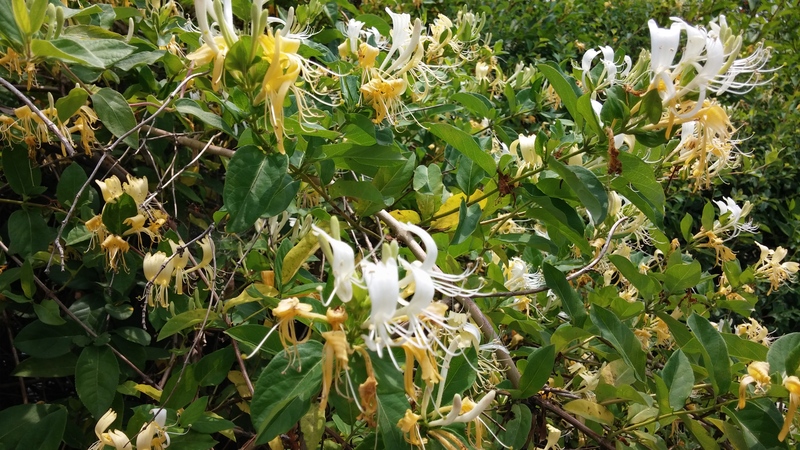 I loved the honeysuckle that was creeping all around the shed. It made the air so fragrant and luscious. This sweet girl is right next door to the Bryan House. 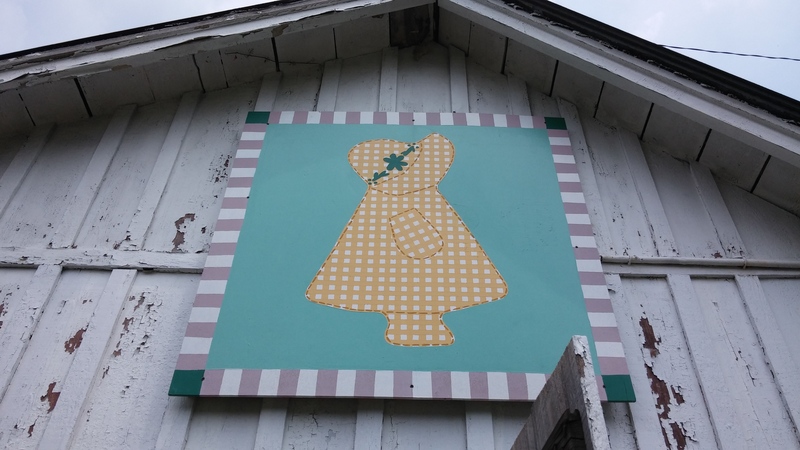 She is all ready for summer decked out in her pale yellow gingham dress and sun bonnet to match. 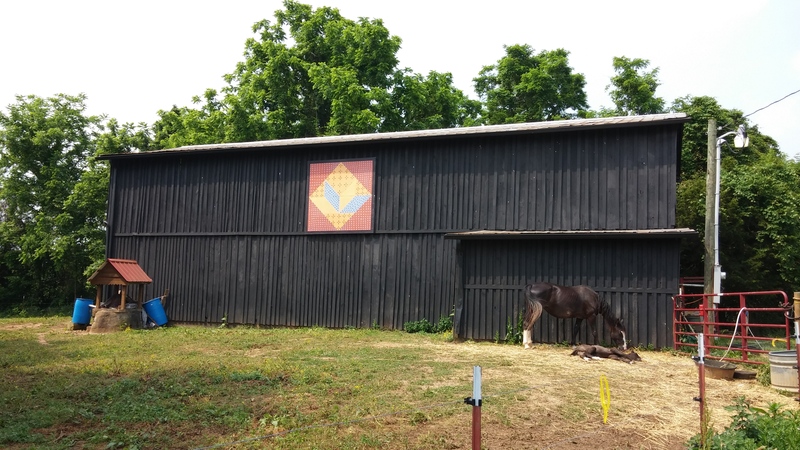 The old shed really adds character to the quilt square. Not only is the little Dutch girl sweet, it is also a family quilt! 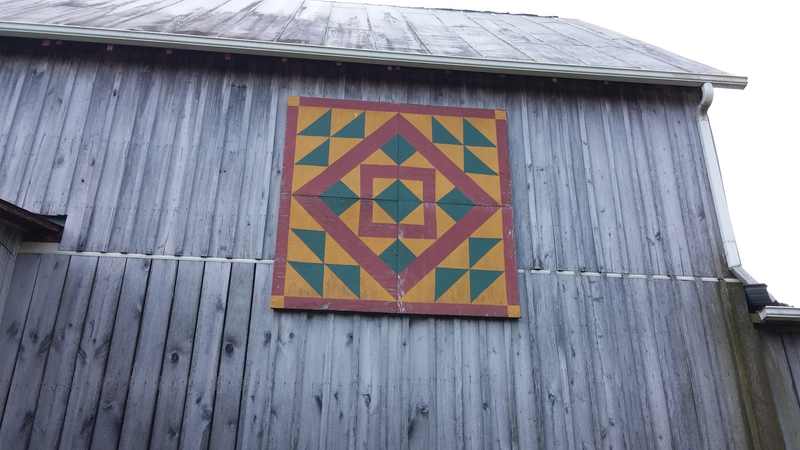 Julie Wilson’s grandmother, Nana, made this quit for her and Julie in turn made it into a barn quilt square. Sunny days just call for an adventure. Sunny days call for windows down, music blasting, and riding down a back road. Sunny days are filled with happiness and life. 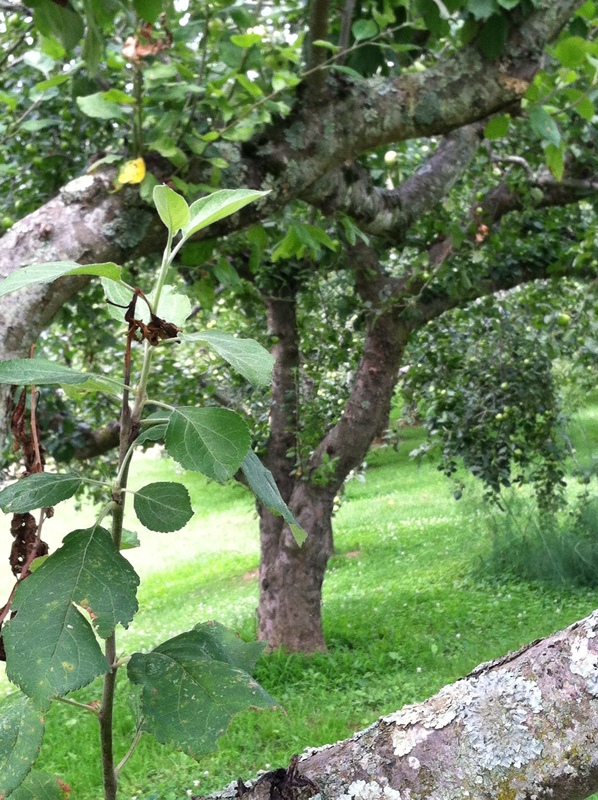 On this particularly sunny day the quilt trail was calling. 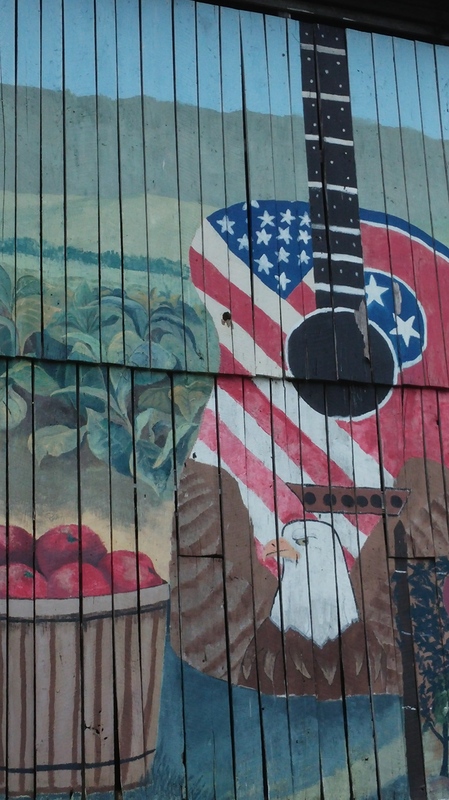 It was calling out to be explored, to take the back roads and explore Rutledge, TN. 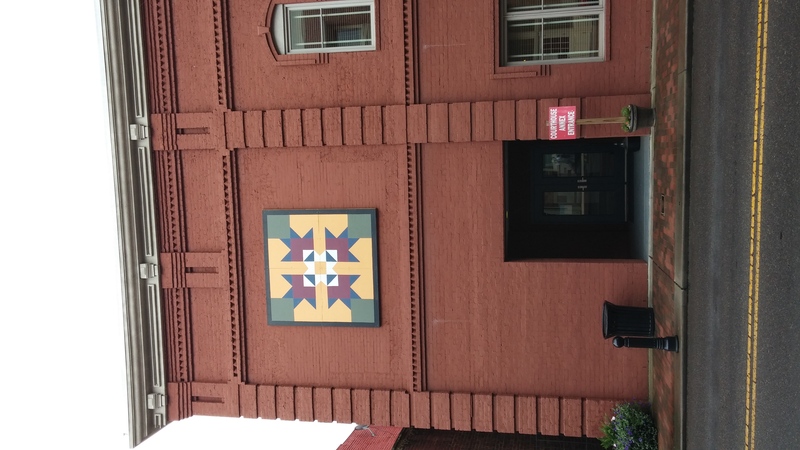 Not knowing where to go, I took my AQT map, jotted down a few areas close to the historic Bryan House and let the quilt squares lead. On my way around these roads I encountered some of Spring/early Summer’s grandeur: box turtles, honeysuckle, wildflowers, horse foals, breeze blowing my hair, and friendly people willing to share some stories with me. Talk about taking the back road! 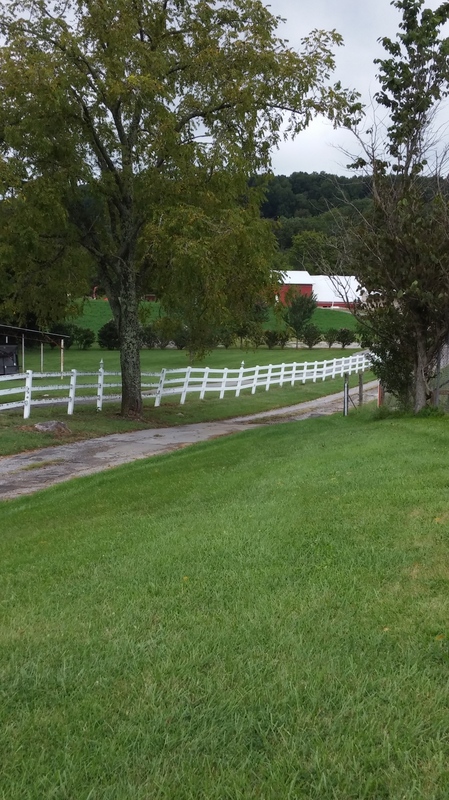 I had to get off 11 W and follow a winding road to this farm. The road took me through pretty areas, such as roads filled with flowers, tomato farms, and of course mountains. Along the way I crossed a box turtle in the middle of the road! At first I thought it was a block of wood then the closer I approached I realized it was a box turtle. Luckily, I realized this in just enough time to let it finish crossing the road. Eventually I found myself at this waypoint on the AQT. I was greeted with such a lovely site, a baby horse! 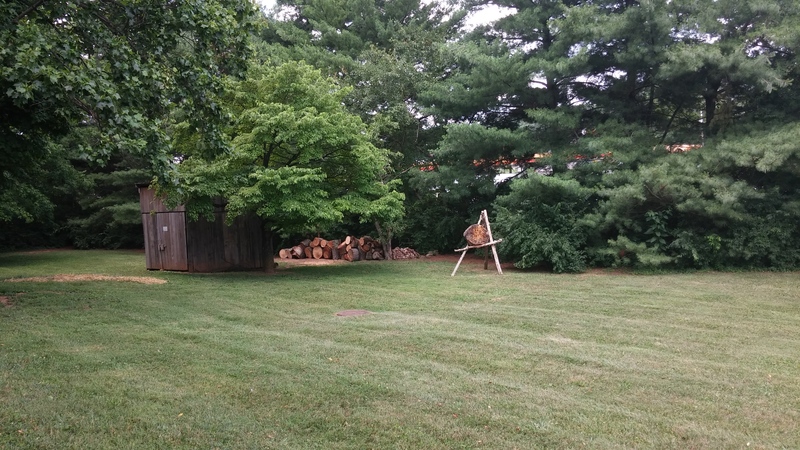 I drive past this every time I come into work and I have always been fascinated by it. So today I let the road, this time the main road, take me there. I pull into a gravel driveway greeted again by horses. Stepping out of my car I felt as if I was transported back in time. Log cabins, an side house, are in my sight. A lady named Doris walked my way as I approached the antique store. Doris was a very friendly lady and was happy to tell me some facts about Country Shed Antiques. Country Shed Antiques is built onto a barn (you could have fooled me it looked so real! Like it was all one piece of property). The first part of the barn, besides the stalls, use to hold tobacco. If you go in the store that will be the room that looks like a kitchen. Originally Doris just had a gift shop, but then it kept expanding into what is now the Country Shed Antiques. If you are ever out this way do stop by. 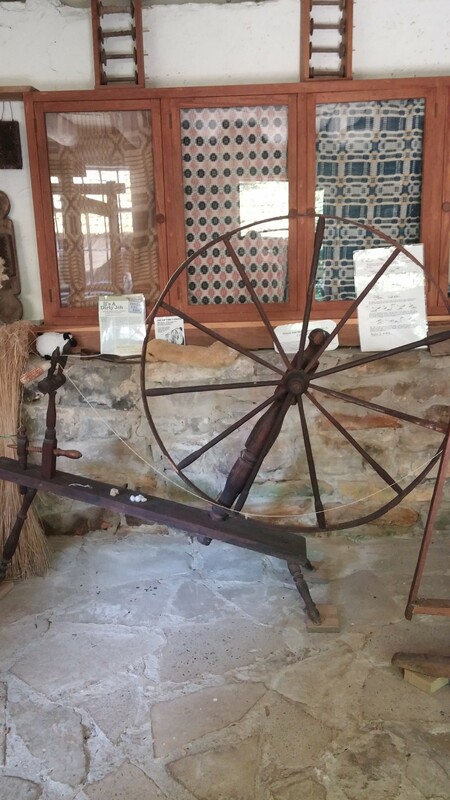 The antiques in this shop are very rustic and would fit into a cabin or old country home. 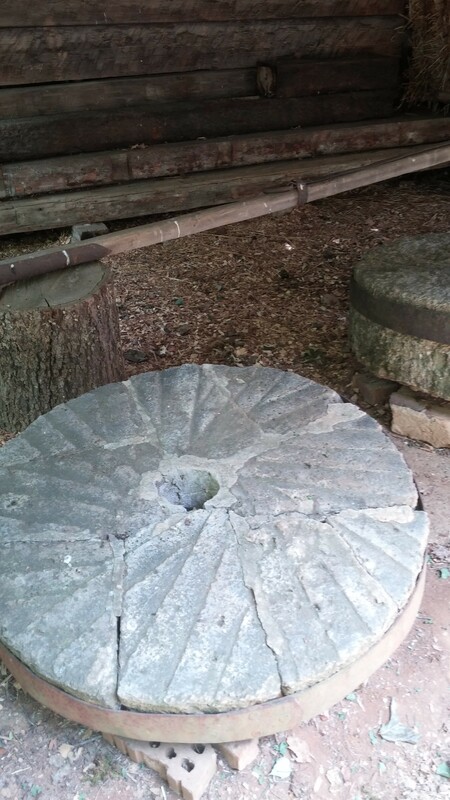 Cast iron skillets, corn pone skillets, mugs, quilts, even a carriage cart to be hooked up by a horse in available! Since it changes with the season, come back many times to see what is in store. Stay tuned for the second half of my sunny day quilt adventure! More quilts, more flowers, more good times!